EVENTS: Corporate, Special Events, Private Events, Festivals, Theme Parks, Art Festivals, Trade Shows, Etc. THE STILT BIRDS...Unique, innovative, enchanting. 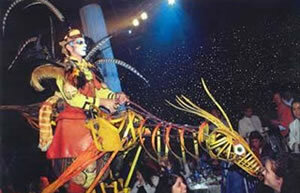 THE STILT BIRDS are a one-of-a-kind entertainment offering. Whether strolling throughout a convention floor, intermingling with guests in a convention ballroom or roving free in an outdoor event setting, these STILTED BIRDS are always entertaining and memorable. Cirque-like creatures made of unique woods (as if they just stepped out of a George Lucas movie), these incredible creations captivate and mesmorize the guests of every event that they appear. These birds are incredibly tall wooden puppets inside of which stilt performers are able to handle them. Complex mechanical systems allow them to articulate tails, wings, necks, heads, crests and beaks...Rendering the fluidness and the truth of the life, interacting with guests, this illusion is so strong that these "skeleton sculptures" escaped from the Supernatural Museum of History seem to be real and alive. STILT BIRDS from Talent Screening Room on Vimeo.